It is commonly known that 70 percent of the earth we live in consists mostly of territorial waters. As the largest ecosystem on Earth, ocean takes a very important role in maintaining the survival of living things. It absorbs carbon dioxide around 30-50%; can be an alternative transportation lines besides air and land; for recreation spot and water sport; good and healthy food sources such as fish, mussels, and seaweed; source of minerals and petroleum, and other benefits. Unfortunately, the sea began to be polluted and exploited by humans nowadays, threatening its existence. To avoid it is getting worse and preserve it, a sea conservation is very needed. Sea conservation is a protection of marine and marine ecosystems themselves throughout the world to prevent those from exploitation. It can also reduce human activities that have damaging effects on the sea. It is established by Marine Conservation Center which serves as a breeding place for protected animals so that they avoid extinction. The protected animals are including sea turtles and dangerous fish such as string ray and jellyfish. Besides animals, you can find many mangrove plants too here which are known as a characteristic of Kepulauan Seribu. Therefore, mangrove plants are cultivated here to prevent coastal erosion and global warming. The entrance ticket for public is only Rp 5000,00 and it opens from 7 am until 4 pm. The cause of endangered sea turtles is the consumption of meat and theft of sea turtle eggs, that is why this sea turtle captivity is formed. The trademark of the sea turtle captivity in Pulau Harapan is hawksbill and green turtles which are rarely found in other places. These sea turtles are not placed in shelters like other captivities but in their original ecosystems with nets as bulkheads. Local people are happy to share new knowledge with tourists about sea turtle life from eggs to adults. The tourists can also hold sea turtles directly and take photos with them. This sea turtle captivity is located inside the Marine Biota Park. Coral reefs has other functions besides for tourist objects, another function of the coral reef ecosystem is as a protective beach. Because coral reefs have many functions, the Pulau Harapan often conduct research to ensure that coral reefs are maintained and continue to grow. Steps include implementing the Biorock Method, which is a coral reef recovery program that combines technology and community involvement and involves divers to perform coral maintenance and ensure Biorock continues to function properly. Then a coral transplant program, installing fish aggregation devices to move the pressure of fishing from coral reefs, and encouraging non-destructive fishing techniques. To overcome the number of mangroves that are thinning, the surrounding community held an action to plant 50,000 mangroves so that the land is not eroded by the sea. This aims to prevent abrasion and and create re-greening on the coastline. It is expected that the mangrove plant can become a tourist and educational destination for people. Therefore, the other purpose of this action is to restore mangroves as an icon of Pulau Harapan. So far there have been around 310 mangroves planted on the island of hope, although they have still not reached the target but are currently in progress. So, when we’re visiting Pulau Harapan, it is necessary to contribute in the sea conservation. There are plenty of easy ways we can do, start from limit and reduce your usage of plastic products by using your own water thermos or tote bag while shopping. As much as possible we also must reduce motorbike riding and walking instead to decrease carbon footprint. Especially if you are a seafood lover, make sure you eat safe and sustainable seafood. 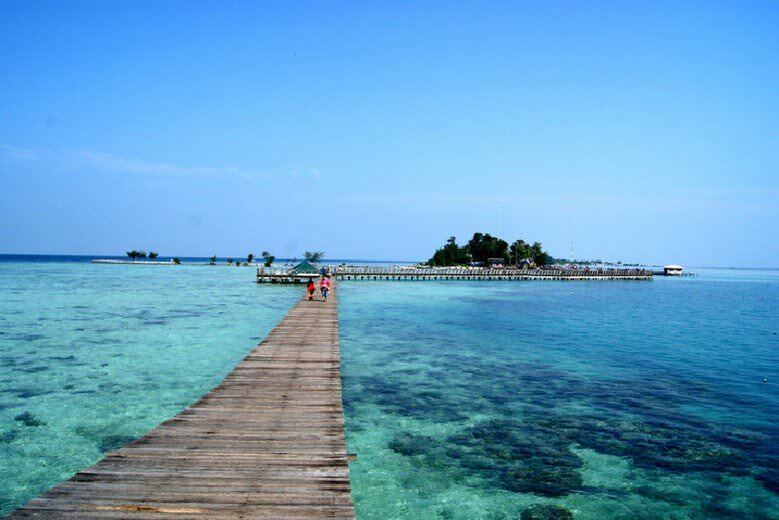 We hope you’ll have a great holiday at Pulau Harapan while participating in preserve the sea ecosystem!